The sewer line on your property is responsible for directing waste away from your home. Over time, leaks can form and damage can happen to the line, making it harder for this component of your plumbing system to do its job. Sewer line repair can be an expensive plumbing service and many homeowners are not financially ready to take on this repair bill. One of the best ways to prevent costly sewer liner repair and replacement is to take steps now to avoid damage to the line. Here are some of our best expert tips to keep the plumber away. Are you considering adding a tree or large bush to your backyard? 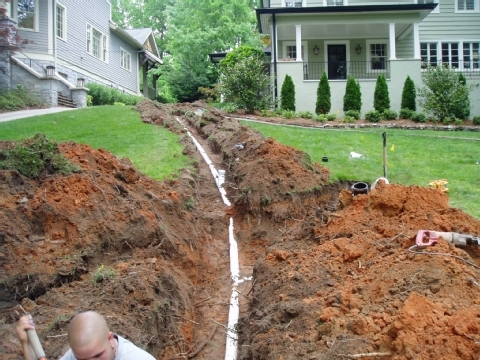 Before you plant, make sure you find out exactly where your property’s sewer line is located. Once you determine the location, plant your new tree or bush at least 10 feet away from the line. As roots grow, they can very easily wrap themselves around the pipe cutting off the flow of water. In some cases, the roots will grow directly into the side of the line and cause the pipe to crack or collapse. Careful consideration when adding landscaping to your yard can prevent this from happening. Residential sewer lines can become clogged very easily over time with toilet paper, waste, and non-organic material that doesn’t break down. Having your sewer line professionally hydro-jetted and inspected once every few years can keep the pipe free of debris and the water flowing in the right direction. For more plumbing tips, call your friendly, neighborhood plumbers in Sierra Madre. My Sierra Madre Plumber Hero is a locally-owned business that works with the best, licensed plumbers in your community. We offer same-day service at great prices, so you never have to wait to get the service you deserve. Call us today for a no-cost, no-obligation, in-person quote!